In this tutorial we will teach the system of type impact collision with a static object, It also may be in motion as you can see the video . 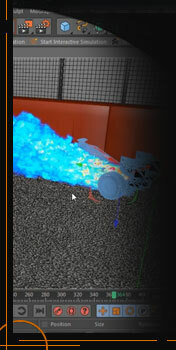 the collision has the new version of cinema 4 d Dynamics system, that has changed since version r12. Now we can have more control over the object and we can also add physical render system. Together with the plugin turbulence to give more realism to the scene. This tutorial has two examples of collision, It´s recommended for beginners and advanced users in cinema 4d .